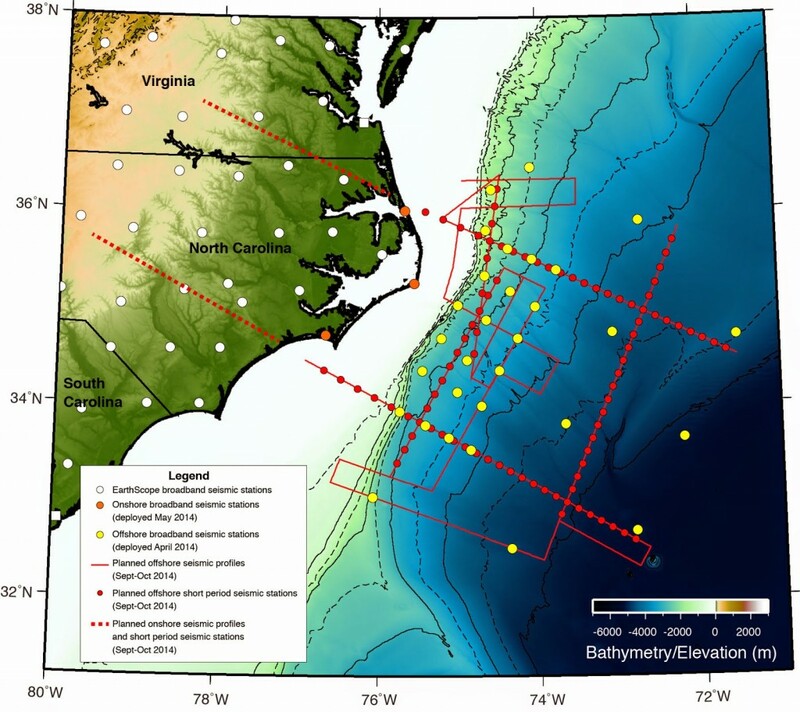 Raw and processed multi-channel seismic (MCS) reflection data and underway geophysical data collected offshore North Carolina and Virginia aboard the R/V Langseth in Sept-Oct 2014 as a part of the GeoPRISMS Eastern North American Margin (ENAM) Community Seismic Experiment are now available for download. Here are links to each of these datasets. The Eastern North American Margin (ENAM) represents the final product of continental rifting to form a passive margin, and records the full history of rift evolution and post-rift processes. The ENAM encompasses large variations in fundamental rift parameters, including the volume of magmatism, the pre-existing lithospheric template, and the duration of rifting. In particular, rifting along the southeastern United States was associated with voluminous magmatism, whereas the northernmost portion of this margin offshore of Nova Scotia and Newfoundland is distinctly magma-poor. ENAM also captures an extensive post-rift evolution of the passive margin sedimentary prism as well as the cooling and further evolution of the mantle lithosphere below. Finally, there are further compelling logistical benefits to studying ENAM, including the leveraging of considerable US infrastructure, including Earthscope (in particular, upcoming USArray deployments), and the USGS Law of the Sea survey activities. Several Themes are outlined in the GeoPRISMS Science & Implementation Plans and some thematic studies and projects are now underway. If you would like to organize a group to begin developing a plan for studying one or more of the RIE themes please contact the GeoPRISMS Office. Click on each theme below to see current projects and some remarks on that theme from the GeoPRISMS Implementation Plan. How was deformation distributed throughout the lithosphere on the Atlantic Margins, and how was it influenced by magmatism and preexisting structural and compositional heterogeneity? How does rift structure and magmatism vary within and between segments along the ENAM? How do mantle dynamics influence the syn- and post-rift evolution of the margin? What processes accompanied the transition from late-stage rifting to mature seafloor spreading? How has the margin been influenced by post-rift tectonics? What controls the large-scale form of the passive margin? What are the magnitudes, mechanisms, and timescales of elemental fluxes between the Earth, oceans, and atmosphere along a passive margin during and after rifting? Is post-rift passive margin morphology self-regulating? What are the scales and frequency of submarine landslides, and what preconditions and triggers landslides? Further information about these topics, a summary of existing datasets, and critical research efforts for GeoPRISMS studies can be found in Section 3.3 of the GeoPRISMS Implementation Plan. The Joint EarthScope-GeoPRISMS Planning Workshop for the Eastern North American Margin (ENAM) was held at Lehigh University in Bethlehem, PA from October 26-29, 2011. This workshop brought together researchers working from both communities to articulate research priorities in the region. A group of about 100 attendees took part, including 11 graduate students. An important goal of the workshop was to focus the broader community effort on cross-disciplinary learning and approaches to collaborative science dedicated to the science topics embodied in the archetypal passive margin. The workshop provided a national and international forum of scientists from universities, national laboratories, federal and state agencies, and industry. The Implementation Plan for the Eastern North American Margin has been updated following the outcomes of the workshop, and is available for download. The goal of the Eastern North American Margin Community Seismic Experiment is to understand the breakup of ancient continents that led to the formation of the eastern edge of North America and the Atlantic Ocean and the later evolution of this continental margin by landslides and other active processes. A record of these geological events is stored in the rocks offshore North Carolina. We will collect active and passive, onshore and offshore seismic data to image geological structures at a range of scales to learn about the evolution of continental margins and their geohazards. This is an academic project funded by the NSF-GeoPRISMS program. The U.S. science community has selected the margins off North Carolina and Virginia as an ideal place to gather this data set. The selection of this region and the design of the seismic study were guided by input from the US scientific community through workshops and online forums. A large group of scientists are spear-heading the effort to collect and disseminate these data. The data will be open to public immediately and will be useful for studying a large range of fundamental geological processes. The project also involves a large training and outreach component; we are bringing students and young scientists to sea and will hold short training courses and workshops after the cruise. Welcome to a field season at Ledi-Geraru, Afar, Ethiopia!